Hitachi, Ltd. and DFKI have jointly developed an AI-based technology to measure the physical strain of workers with a sensor suit. The system detects and quantifies physical stress in real time and informs users of incorrect posture and unergonomic movement patterns. DFKI and Hitachi will present the technology at the Hannover Messe in Hall 2, Stand C59. In a society in which skilled labor is in shortage and in which recruiting new workers is becoming increasingly difficult, the preservation of the workforce is an urgent concern. Issues such as preventive risk avoidance and health protection, especially for workers in manufacturing and maintenance, are moving more and more into the spotlight. An analysis of the extent of their physical strain helps to increase the safety of employees and protect their health. Traditional approaches use stationary cameras to detect and record worker activity. However, this approach does not ensure a quantitative and stable assessment of physical stress: Cameras are limited in their measuring range, and when taking pictures in production facilities or outdoor facilities, there are often blind spots in which the worker&apos;s movement profiles are not recorded or only partially recorded. 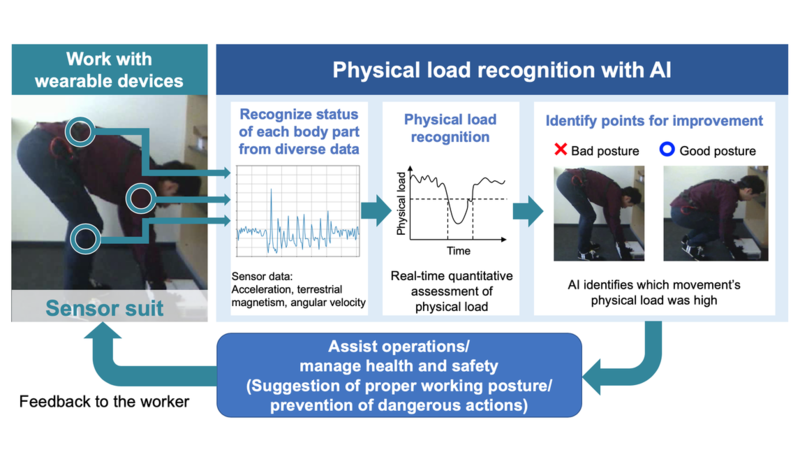 DFKI and Hitachi are developing a new AI-based technology that records a worker&apos;s movement data directly on the body using wearables, recognizes the physical load and evaluates it. The combination of Hitachi&apos;s activity detection technology and DFKI&apos;s AI technology is a unique feature.